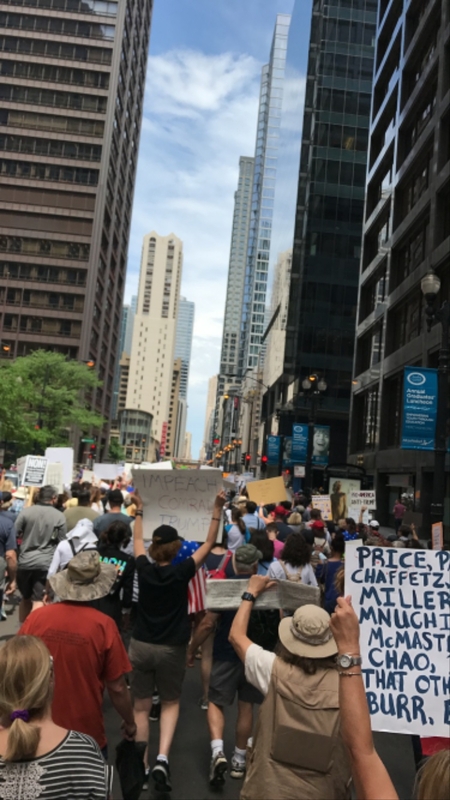 On June 3, 2017, an estimated 1.2 thousand activists gathered at the Federal Plaza in Chicago to demand change in what was known as the March for Truth. The march, lead by Indivisible Chicago, pushed for a greater transparency between the Trump Administration and average citizens, demanded an independent investigation into the allegations against Russia for interference in the 2016 general election, and asked for the Department of Justice to continually investigate both police brutality against minorities and sexual harassment in the workplace. Participants in the march first met for a rally at the Federal Plaza, which involved a mix of songs and speakers, including several United States Congressmen. After, the activists took to Dearborn Street, marching up to Wacker Drive, then continuing along the riverfront to end right across from Trump International Hotel and Tower. Many groups were represented, including a local chapter of the Communist Party, a pro-marijuana group, and several candidates for Illinois offices, including the more moderate Chris Kennedy and the more progressive Ameya Pawar. Indivisible Chicago is the local chapter of Indivisible, an organization formed in the wake of the 2016 General Election pushing for resistance against the Trump Administration through both activism and education. Indivisible Chicago has several meeting locations throughout the Chicagoland area.